To provide the finest finishing available in the area. To provide the best customer service available. To continue to be The Finishing Shop everyone in the Columbus area uses for high quality work. I was fortunate enough to have been trained by my father, John Daniele, who has been finishing furniture for 62 years and continues to help in the shop at 83 years of age. I am still learning from him. 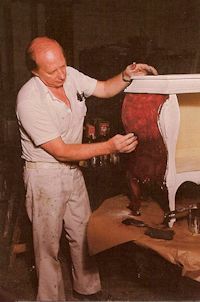 He apprenticed at a highly regarded decorating firm in Cleveland and became shop forman and field supervisor in a very short time because of his talents. He has taught me how to finish everything from a raised panel cherry library, a gloss black piano, marbleized columns, glazed walls, gold and silver leafed dining chairs, high gloss mahogany conference tables, and just about everything in between. While attending Ohio State University majoring in political science with a brief time in the school of architecture, I began my finishing career with staining and finishing tables, chairs, and woodwork in the campus area. I opened a small shop soon thereafter and have not stopped since. With my fathers guidance, I feel our shop's skill and knowledge is second to no one. We use hand stripping, flow over and dip tank methods of stripping with a alkalyne methylene chloride stripper and a water wash.
Our main finishing products are aniline dyes and toners, oil stains, and nitrocellulose lacquer's. 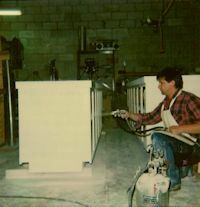 Our spray system is conventional pressurized air which we feel is best suited to lacquer. We NEVER stain raw wood. We always use analine dye for color and seal before we stain for uniform color and richness. All quality furniture manufacturers finish this way. If you are getting bids on refinishing, ask the finisher about this. If he stains over raw wood, you will not get a high quality finish. We always apply multiple coats with fine sanding between all coats and final rub our finishes. We are highly skilled at both stain and paint finishes.